Homemakin and Decoratin: Munchies vs. Coasters Makeover. . The evenings are quite uneventful for me. Hubs works all evenings and I'm .. well, left home alone.. this could be bad. Especially if I have the munchies! Boredom + got-the-munchies = b.a.d! So I try to find things to do to keep myself busy. 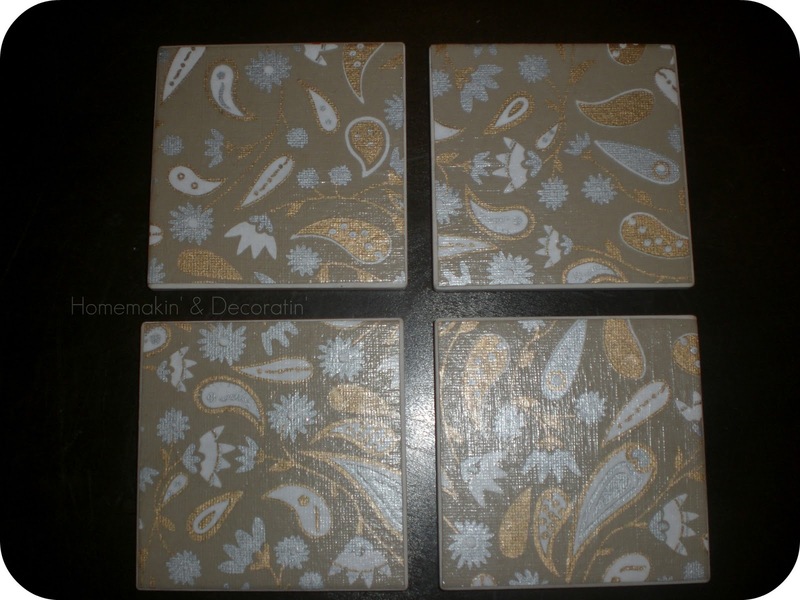 Tonight I did a little makeover on our coasters that were given to us when we got married. Their appearance never did find my favor, but we've used them faithfully on our coffee table whenever we have a snack together while watching a show (currently we just started watching Who's the Boss- love it). Mod Podged the paper right to each coaster then a couple more layers of Mod Podge on top. 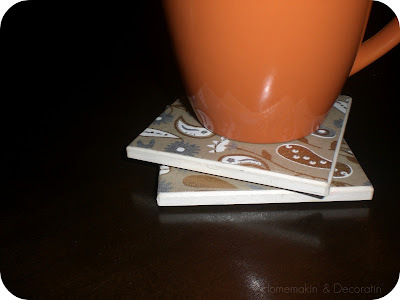 Lovely new coasters that make me happy! Mmmm.. hot chocolate? and mini marshmallows? ..Uuummm, maaaybe I should find another craft to keep myself busy..! I just tasted a spoonful of my YUMMY Mocha Almond Fudge ice cream, and I could definitely go back for more! ... uh-oh . .